Feel grounded with the energies of this mala bracelet which combines the feminine softness of Rose Quartz with the earthy strength of Petrified Wood. Selected beads have been blessed by the Dharma Protector of Kechara during trance in the monastery, bestowing protection from harm and negative energies. Feel grounded with the energies of this mala bracelet which combines the feminine softness of Rose Quartz with the earthy strength of Petrified Wood. 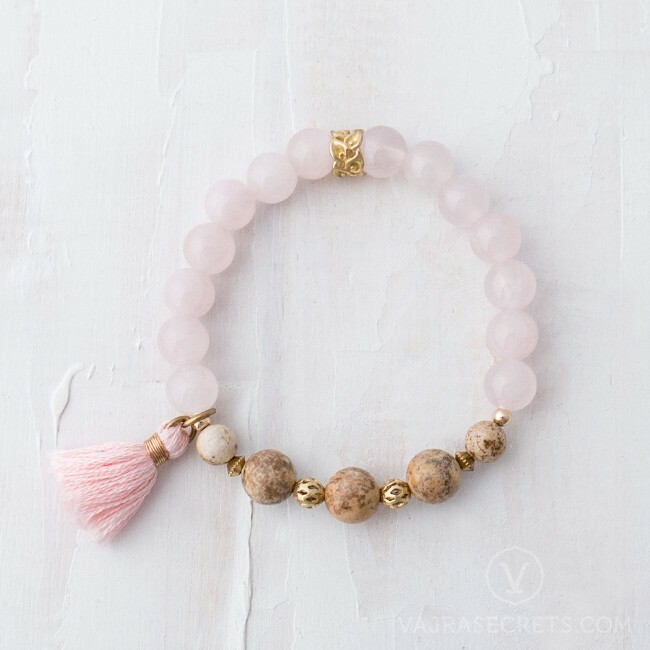 Gold-filled spacers and a dainty pink tassel complete this pretty mala bracelet. Selected beads have been blessed by the Dharma Protector of Kechara during trance in the monastery, bestowing protection from harm and negative energies. As trances are very rare even in the monasteries, so are items blessed by the Protector. Rose Quartz symbolises the energy of unconditional love and is said to open the heart chakra to all forms of love - family, friends, romantic and one’s self. It stimulates the imagination and creativity such as art, music and the written word.